Create a memorable promotion with our wide selection of personalized tattoos! Our printed temporary tattoos are non-toxic and can easily be removed with water. Orders must be placed for even quantities - 200, 500, 1000, 3000 or 5000. Please note: Orders must be placed for even quantities - 200, 500, 1000, 3000 or 5000. Order placed for between column quantities will be rounded up to the next highest quantity. Safe, Non-Toxic, Hypoallergenic tattoos are people friendly, FDA and CPSC compliant. Exact color match is not guaranteed. Tattoo instructions come standard on the back of each tattoo. Personalizing the back of your tattoos with a custom black imprint is available at no additional charge. White Imprint Information White ink effects can be added for FREE with designs that require a light or white background. No White: The design area is transparent (the white tattoo paper backing is visible) but will transfer clear on the skin and be skin tone. Spot White: White ink is only printed in specific parts of the design. For example eyes will actually look white when transferred, but no white will be behind the design. Flood White: White covers the entire image (not the background) and once transferred looks more brilliant in color because the layer of white makes the image more opaque. Fun idea for team support! We work with children via Casey's Foundation - a 501c3 Non-Profit. Our emphasis is Drowning Prevention and Water Safety. We are hoping that, by the children wearing these, it will engage people into a discussion about water safety. How long will these temporary tattoos last? BEST ANSWER: Our sweat and smudge-proof temporary tattoos will last from 3-5 days, even in the shower or the swimming pool! The length of time may vary, depending on how and where the tattoo is applied. To make the most out of your tattoo, be sure to apply it to clean, dry skin that is free of oil, lotion or makeup. Try to choose a smooth, hair-free area of skin that doesn't crease or stretch when you move. Also, the tattoo will last longer if it is applied to a part of your body that doesn't rub against straps or clothing. Are temporary tattoos safe for my skin? BEST ANSWER: Absolutely! Our people-friendly temporary tattoos are safe, non-toxic and hypoallergenic. Made in the USA with cosmetic-grade inks, our tattoos meet or exceed requirements and standards of FDA, CPSC, ASTM, as well as all Canadian and European Union standards for importation of products designed for dermal contact. All products are tested annually and we conduct 3rd party audits to ensure and demonstrate our companys commitment to quality and safety. BEST ANSWER: Flood white is when the entire tattoo image has a layer of white behind the colors. This procedure enhances the vibrancy of colors, as well as showing white areas of your artwork as white instead of clear. BEST ANSWER: Spot white is used when only the white areas of your artwork will have white ink. Your skin color will not show through when applied as those areas will appear white on skin. Any area in the artwork that does not have white will appear clear on skin. White ink cannot be applied to our Prismfoil, Glitter or Sugar tattoos. How do I remove tattoo? BEST ANSWER: For easy tattoo removal we suggest rubbing the tattoo with baby oil or rubbing alcohol and a clean cloth since temporary tattoos are resistant to water and soap. How do I apply tattoo? BEST ANSWER: First, remove the clear, protective top sheet. Next, place the tattoo in the desired area, with the image side facing your skin. Then, press a wet towel, paper towel, or sponge to the back side of the tattoo for 30-60 seconds. Last, slowly remove the paper backing from skin and allow the tattoo to dry before touching or covering it with clothing. I am a professional dog trainer and have been working with my local police department and metro parks in an event called "Safety Day" for kids. 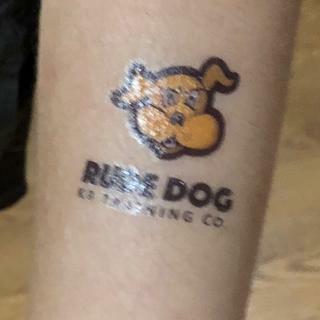 I have been involved with the program for over 15 years and these tattoos are a huge hit with the kids. Hi Brett, thank you for your positive review! We are so glad you and the kids are having fun with these. We look forward to working with you again on your next project!